The Singapore International Mediation Institute (SIMI) is the premier independent professional standards body for mediation in Singapore and the region. SIMI was incorporated on 15 July 2014 as a non profit organisation, with support from both the Ministry of Law as well as the National University of Singapore. SIMI is headed by an international Board of Directors with representatives from both mediation practitioners as well as corporate users of mediation. SIMI works closely with the International Mediation Institute (IMI), a non-profit public interest initiative to drive transparency and high competency standards into mediation practice across all fields, worldwide. 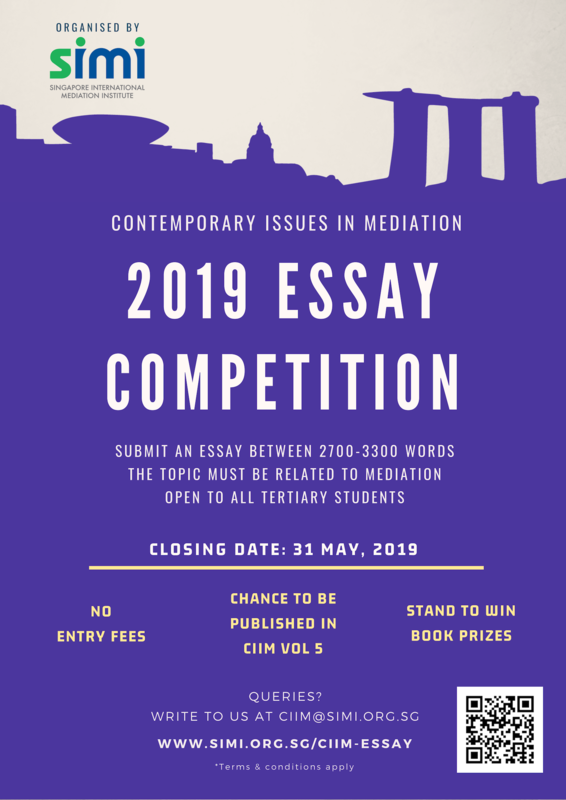 SIMI CIIM Essay Competition 2019 16 JAN 2019 The SIMI annual mediation essay competition 2019 is now open! Entry is free for all students from tertiary institutions in Singapore or overseas! 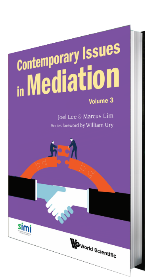 Get a chance to publish your work in Contemporary Issues in Mediation Volume 5! Help to share and spread this news to all your friends. Find out more here! 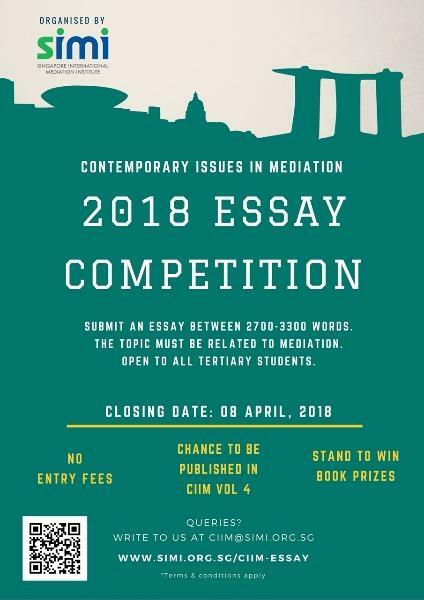 RESULTS: SIMI CIIM Essay Competition 2018 16 JAN 2019 Congratulations to all the top winners of SIMI Annual Essay Competition 2018! Click here to find out who are the winners. CIIM Vol. 3 18 SEP 2018 The third volume in the widely acclaimed series, "Contemporary Issues in Mediation" was officially launched on 18 September 2018. The essays in this volume fall neatly into three categories: Mediation Landscape; Mediation, and Social Justice and Mediation skills. Read more here. In Memoriam: Frank E.A. Sander 9 APR 2018 "Remembering Alternative Dispute Resolution Pioneer: Frank E.A. Sander (1927-2018)" is a tribute from Assistant Professor Dorcas Quek Anderson to her late mentor, Prof. Frank E.A. Sander, a pioneer and leader of the alternative dispute resolution movement we have all come to cherish and work for. Read more here. FEATURE: 2018 Women in Mediation 30 MAR 2018 SIMI is proud to present a special feature of interviews with 11 Practitioners, Advocates & Supporters in Singapore. From young professionals to ground-breakers, we trust our readers will find great insights from their sharing and experiences, just a snapshot of Singapore’s vibrant mediation community. Read more here. Mediation Act 2017 1 NOV 2017 The Mediation Act and its subsidiary legislation, the Mediation Rules, has come into operation on Nov 1, 2017. Find out more here. 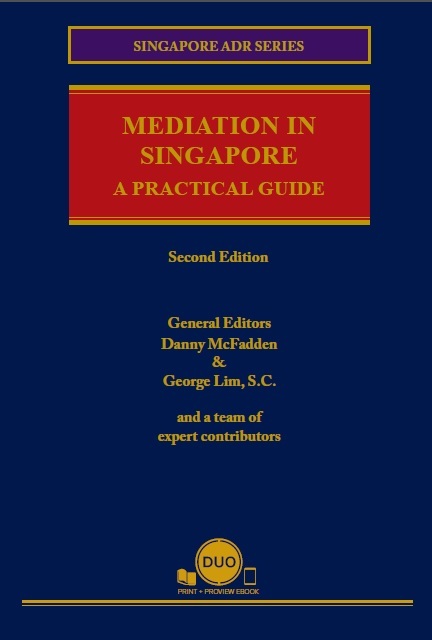 Mediation in Singapore: A Practical Guide (2nd Edition) 4 DEC 2017 The second edition is an update on the seminal guide to "Mediation in Singapore". Head on over to the "Resources" section to download a PDF copy of the review. 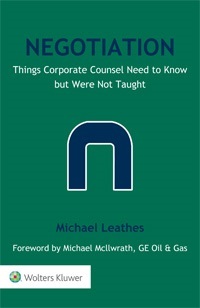 Negotiation: Things Corporate Counsel Need To Know But Were Not Taught 4 DEC 2017 Authored by Mr. Michael Leathes, this book is a must-read text on negotiation and its relevance to the success of the modern-day in-house counsel. Head on over to the "Resources" section to download a PDF copy of the review. CIIM Vol. 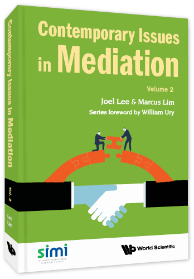 2 4 DEC 2017 Contemporary Issues in Mediation Volume 2 was launched on 8 November 2017 at the NUS Faculty of Law. It features 3 essays on Family Mediation. Click here to find out more. The book review of CIIM Vol 2, is also available, head on over to the "Resources" section to download a PDF copy of the review. Not familiar with the mediation process? Find out more about mediation and how it can work for you. A tool for parties and/or their counsel to use in evaluating the individual options for resolving conflicts. A framework for parties to use when considering a suitable mediator. Learn more about how your organisation can be a part of our growing network of SIMI Partners. If your course is successful in applying for SIMI RTP status, you will be able to offer course participants who pass the course assessment the opportunity to apply for SIMI Accredited Mediator Level 1. SIMI QAPs are able to offer the full suite of SIMI Schemes and are the only SIMI Partner able to qualify SIMI Certified Mediators. Join our family of SIMI Mediators today. Find out more about the SIMI Credentialing Scheme and how you can embark on your own fulfilling journey towards becoming a SIMI Certified Mediator. The SIMI Credentialing Scheme comprises of 4 different tiers. The first three tiers are collectively referred to as SIMI Accredited Mediators with the highest tier being SIMI Certified Mediator. SIMI Certified Mediators are given their own individual and separate profile page. SIMI Certified Mediator profiles are also accessible on the SIMI search engine to enable potential users to make informed decisions when appointing mediators. Whether you are a SIMI Mediator looking to appoint a Reviewer, or a Reviewer who has just been appointed, find out more about this important component of the SIMI Credentialing Process here. As a SIMI Mediator, you will have a great degree of flexibility in appointing your desired Reviewer so long as you take into account these guidelines when appointing a Reviewer. Reviewers are expected to provide an honest and objective summary of feedback about their Mediator’s performance based on discussions with the Mediator and the information on Feedback Forms received from Users who have worked with the Mediator.